* Winner of the Andrew Carnegie Medal for Excellence in Fiction * New York Times Bestseller * A New York Times Notable Book and a Washington Post Notable Fiction Book of 2017 * Longlisted for the National Book Award for Fiction * Named a Best Book of 2017 by NPR, The Guardian, Vogue, Esquire, Kirkus Reviews, Philadelphia Inquirer, BookPage, Bustle, Southern Living, and St. Louis Post-Dispatch "Immensely satisfying...an old-fashioned page-turner, tweaked by this witty and sophisticated writer...Egan is masterly at displaying mastery...she works a formidable kind of magic." -Dwight Garner, The New York Times The long-awaited novel from the Pulitzer Prize-winning author of A Visit from the Goon Squad, Manhattan Beach opens in Brooklyn during the Great Depression. Anna Kerrigan, nearly twelve years old, accompanies her father to the house of a man who, she gleans, is crucial to the survival of her father and her family. Anna observes the uniformed servants, the lavishing of toys on the children, and some secret pact between her father and Dexter Styles. Years later, her father has disappeared and the country is at war. Anna works at the Brooklyn Navy Yard, where women are allowed to hold jobs that had always belonged to men. She becomes the first female diver, the most dangerous and exclusive of occupations, repairing the ships that will help America win the war. She is the sole provider for her mother, a farm girl who had a brief and glamorous career as a Ziegfield folly, and her lovely, severely disabled sister. At a night club, she chances to meet Styles, the man she visited with her father before he vanished, and she begins to understand the complexity of her father's life, the reasons he might have been murdered. Mesmerizing, hauntingly beautiful, with the pace and atmosphere of a noir thriller and a wealth of detail about organized crime, the merchant marine and the clash of classes in New York, Egan's first historical novel is a masterpiece, a deft, startling, intimate exploration of a transformative moment in the lives of women and men, America and the world. 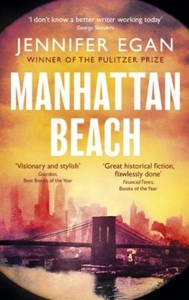 Manhattan Beach is a magnificent novel by one of the greatest writers of our time.